You are currently browsing the archives for the Configurations category. Here we go, I finally think that this version is ready for release – I had planned to launch this on June 1st – glad I didn’t make that known to anyone at the time. I have been hard at work making changes, the big new additions are out of the box support for Lyrics (I finally caved on this one – the component used is included in the package), full transparency support, library filter support and the Theme and Background selectors. All component and font requirements are listed when you first open the configuration, an installation display will show what you do not have installed and shall provide a click-able link to download it. Now Playing section instead to close/hide the box. This is much faster and easier. Menu Buttons: Full Mode button now increases fb2k window size to a minimum of 800 pixels (if it’s currently smaller than that in tabbed mode) when Full Mode selected to allow correct display. Menu Buttons: Cog now opens menu but defaults to the “controls” section with seekbar, search, etc. Now Playing: New Quick SCPL Playlist using transparency in PanelsUI v0.13, with optional side image showing a preview of selected track’s cover art. Now Playing: Improved the Progress Bar, now also displays track length, year and genre. Menu: Removed Menu Toolbar as now available as button, also caused problems with VS clashes. Full Mode: Added Borders (optional), tidied it up – combined all playlist control/browsing into one tab, smarter solution. Split popup browse and browse tab removed. 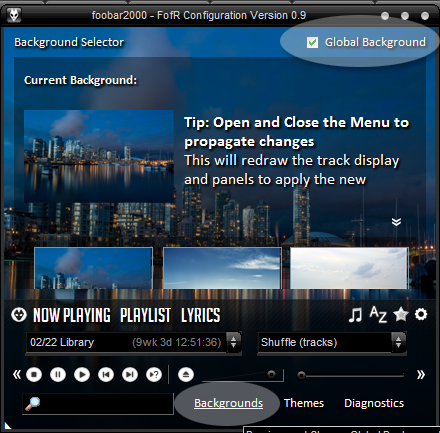 Global Background: Added support for a global background image, using transparency of Track Display, SCPL and Library Filter. Installation: On Installation diagnostics will check which components/fonts/images are installed/located and if not will give download links or highlight the problem. Can be re-opened by clicking the diagnostics link in the menu. Transparency can show the wrong image when backgrounds/themes are changed, an fb2k restart will fix this. This is a PanelsUI issue. Transparency and Global backgrounds are turned on by default. The redrawing of large images and text shadows shall inevitably reduce performance. For those wishing to optimise, turn off transparency via the background selector (see this image for help). Turning off transparency in SCPL cannot YET be automated so you need to change this manually, to do so right click the SCPL, select Settings then at the bottom click the “Transparent Background” checkbox. This will improve your scroll speeds, don’t forget to re-enable it if you switch back. Here’s an image showing the box. Adjusted requirements on installation to include Wingdings 3 font. The idea I had was complete minimalism, nothing that would waste any space. So of course, it may look like Fisher-Price foobar compared to the other releases, but that’s the point of minimalism. It’s painfully easy to use, click M to get to the Mini Player, P to get to playlist, and double click M to get to the diagnostic. All the browsing options can be found at the top of the playlist, and need their own color coordinated. Also its quite an easy start if you want to learn how to code foobar, everything is right there as you see it. And if not obvious, the foobar looks best with the SlanXP visual style. Introducing ssconfig4, a new layout for panelsUI. ssconfig4 is designed to be very easy to use, powerful, and still retain style and Configurability. This is a no-titlebar, panels_ui layout designed to work with any visual style, but is based on the excellent Elfen2 VS. This is an as-is layout, I won’t be taking any feature requests but I’ll still try to help people who have problems setting it up. If you want to change something or add or remove panels, you’re on your own. colored text in the readme refer to new layout features or updated info. See the very comprehensive readme included for installation instructions and usage. I changed quite a bit in this patch, consider it the proper release whereas the other one was just a test. The idea of this foobar was one that was pretty, fairly specific to my theme, but above all else, useable and obvious – it is designed so you do not have to click around for ages to do simple things. It is also configureable as you wish, you can choose from a multitude of options as to what things to have shown and hidden and where. It may look odd on other visual styles.